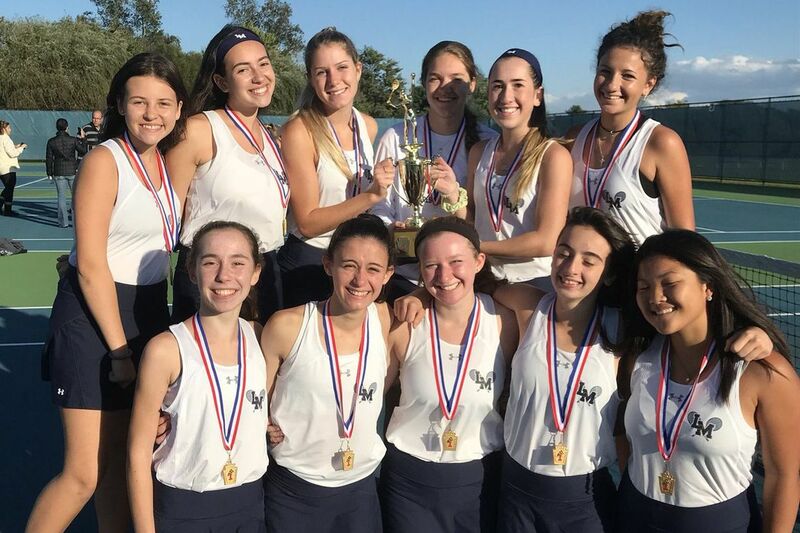 Lower Moreland girls’ tennis defeated Gwynedd Mercy to capture the District 1 Class 2A title. The Lower Moreland girls' tennis team defeated Gwynedd Mercy, 5-0, to win the District 1 Class 2A title. The Lions' singles teams won in dominant fashion, only dropping one game between three players. Nikole Lisovyy and Elizabeth Berzin both beat their opponent 6-0, 6-0. In the second singles match, Lower Moreland's Ally Cheiken defeated Gwynedd Mercy's Isabella Kellner, 6-0, 6-1. In the first doubles match, Lions' Maeve McErlean and Nicole Stone defeated Dragons' Bella Bauman and Olivia Urie 6-1, 7-5. To complete the sweep, Lauren Oblon and Julianna Litz beat Jordan White and Audrey Keen, 7-6 (8-6), 6-1. Maddie Hill, Gabby Edwards, Brianna Davis, and Clare Robinson each scored a goal as Abington Friends topped Solebury School, 4-0. Claire Rosenwinkel made two saves for the Kangaroos. Rian Coleman and Elizabeth Eckert recorded a goal apiece in Franklin Towne Charter's 2-1 triumph over Masterman. After trailing 2-0 in the first half, Notre Dame scored four unanswered goals thanks to Lauren Curran's hat trick and Jess Schneider's goal as the Irish edged Villa Maria, 4-3. Emily Graeff had two assists for the victors. Plymouth Whitemarsh cruised past Upper Moreland, 10-0, behind Ava Borkowski's hat trick. Sam Spera, Autumn Luptak, and Kaleigh Missimer each contributed two goals for the Colonials, who improve to 17-1 overall and 14-0 in Suburban One American play. Mia Impagliazzo collected three goals and an assist as Unionville rolled past Sun Valley, 7-0. Kendall Gardiner and Amanda Panati added two goals apiece for the Indians. Chakra Wade scored the game's only goal in the second half to lift Academy of the New Church over Friends' Central, 1-0.